Greensleeves piano music with flowing chords is beautiful and attainable for your very young and new students, if treated as a DUET. As soon as they can play broken chords with each hand, give them this lovely duet to inspire them to improve their facility. One that uses all Alphanote lettering - music notes with letters. One that has a FEW helper notes. One reason I wrote these duet-parts-all-on-one-page arrangements is because I have heard other pianists struggle with my Greensleeves free sheet music, trying to put the parts together. Separately, they are easy. But coordinating the parts can be hard. Because of the way I wrote the chords, with each hand having three notes, it is easier to read as 6/8 time. However, the MELODY is easier to read as 3/4 time! I have heard people - kids and adults too! - get stuck into an almost syncopated sound on the melody, holding the half note for an extra beat (in 6/8 rhythm). If it seems too tedious to count 6 beats, try counting 1-&-2-&-3-& instead. The melody goes "THREE (and) ONE (and two and) THREE (and) ONE(and two) AND THREE (and)" etc., with the capital letter words being the struck notes, and the words in parantheses being the non-moving beats. The ERROR that I have heard melody players perform, on the other hand, sounds like "THREE (and) ONE (and two and three) AND ONE (and two and) THREE AND", etc., or along those lines, anyway! It's not accurate, it's not as pretty, and I would imagine that it isn't as satisfying for the players. BUY ALL THREE ARRANGEMENTS FOR A TOTAL OF $5.00! Aside from the fact that these Greensleeves sheets are beautiful and easy enough for a young beginner, why should you buy Greensleeves/ What Child is This Duets from me? The 12-page collection is available immediately as a digital download onto your computer, for only $5.00. You don't have to download any new software into your computer in order to acquire the PDF. I don't know about you, but I detest clogging up my computer with yet another program I didn't know I needed. You just need a version of Adobe Acrobat or another PDF reader, which all computers come with. If you DON'T have Adobe Acrobat or a similar program, then you couldn't download any of my other PDFs either. The notes are nice and big, making reading easy. I give you permission to make unlimited copies, for your students only. This is a real deal! 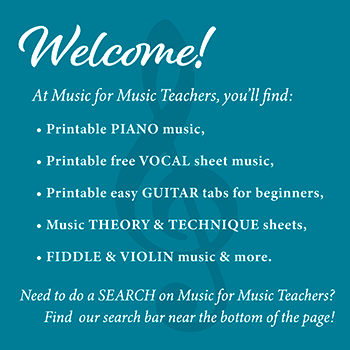 Ordinarily, on other sites, one copy of sheet music, for just one student, will cost at least $5.00, and then there might be tax and postage too! Please do not share with anyone besides your students. Paypal, the payment system I use, is a secure and recognized payment system. You can pay by credit or debit card, or your bank account. E-Junkie delivers the PDF document, working as a partner with PayPal... your purchase is guaranteed. Any problems downloading? Email me through the Contact link at the bottom of this page. This duet is a perennial favorite at my studio - with each new student, it is a new delight! Beginners love broken chords, and how they instantly sound like real music.